So, I nixed the plan to take down the Christmas tree and left it half-decorated, with open ornament boxes strewn everywhere. 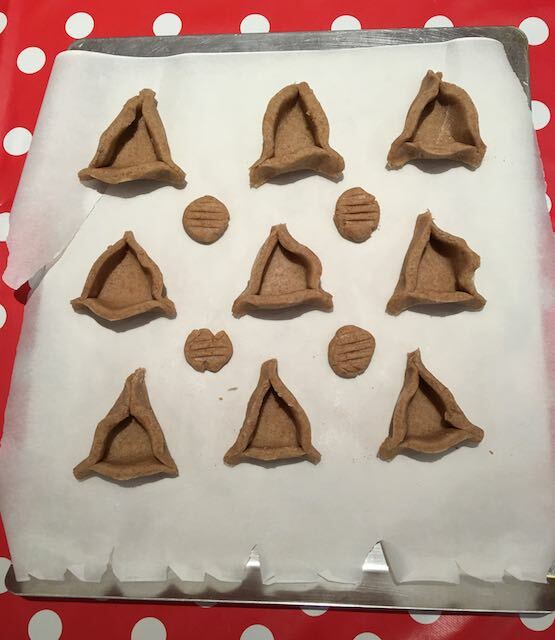 I had no idea how to make hamantaschen (which apparently is also spelled hamentashen and hamentaschen), and in all honesty, couldn’t remember what they actually were. When I saw them, I thought, “I can do that.” Of course, I meant that loosely. Not in the Pinterest way. When I do cookies, I like to try to involve the kids in some way. Of course, getting kid “help” means it takes twice as long and makes twice the mess. But it’s always a lovely bonding (screaming, pushing, shoving, crying) experience for all. I guess I’m a bit of a masochistic baker. I decided to try the recipe from Something Sweet, so I grabbed the ingredients together and realized I only had whole wheat flour. Great. How do I not have white flour in the house? Do I have time to go get some? Not really. Whole wheat hamantaschen it is! I threw it all together, let it rest in the fridge, rolled it out, cut it out, made it into little boats/hats and only then called the kids in. They helped me fill the cookies with melted chocolate and cherry, orange and ginger, date and strawberry jams (why do we have four open jars of jam?). They actually looked pretty good. A little “heartier” than the ones I’d seen, but the whole wheat flour makes them “healthier”, right? I tossed them in the oven and hoped we’d have enough time for them to bake thoroughly before we had to race out to gymnastics. At the last minute, as the kids were getting on their shoes, I pulled them out of the oven. There were two issues, first being that most of them had opened like thick whole wheat flowers, losing all their little boat shapes. Then, as I grabbed the second tray, the entire sheet of parchment paper slid off landing in a hammentashen pile-up on the oven door. Lovely (I think I may have uttered a few “bummers” here). I scooped them up, literally with a spoon, plopped them back onto the tray, quickly pressed the non-piled ones back into boat shapes, and raced out the door. My Pinterest debut will just have to wait. Post-gymnastics, I reassessed the mess and decided that some were okay, but three were going in the “kid” pile for future snacks, and two had to be trashed completely. So, all in all, it was a successful birthday creation. Do I want it to become an annual tradition? Well, we’ll just have to wait and see whether they’re edible. I did use them as our “cake” this year and just stuck a candle in one. 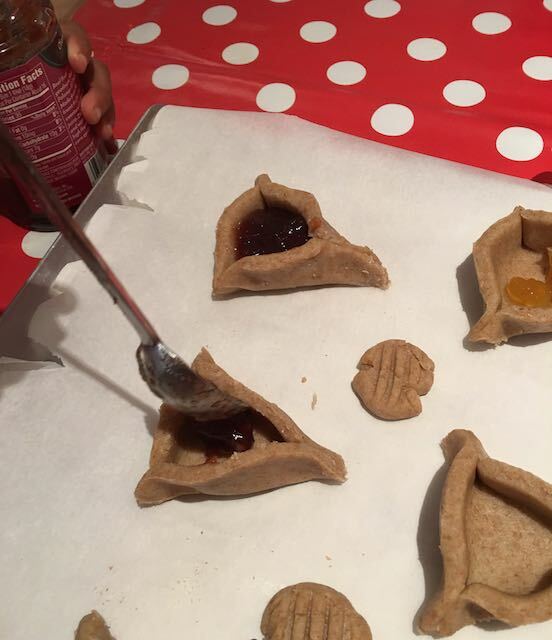 The slapdash hamantaschen were a nice balance to our slapdash Bahraini dhow fruit ship which accompanied them. And the next time my husband makes a random baking request, I might just pretend the kids were screaming too loud for me to hear him; or at least check and make sure I have flour in the house first.